Barry Shrage, left, views fire wreckage in Haifa. In 2014, as war raged between Israel and Hamas in Gaza, Boston’s Jewish community rallied at City Hall Plaza in the heart of Boston. Every day, Hamas was launching rockets by the hundreds at Israel’s cities and civilians. We came together to support Israel in its time of need. The rally attracted more than 3,000 Bostonians who demonstrated our solidarity with Israel and drew support from one another. As the last speakers stepped from the podium, a rainbow – and then a double rainbow – appeared, arcing from the nearby Holocaust memorial over the crowd, toward a more hopeful future. For many of us gazing up into the sky, the message was clear. Even in the darkest of hours, God is present. God remembers the covenant and promises a world renewed, a world filled with rebuilding, a world filled with promise and hope. 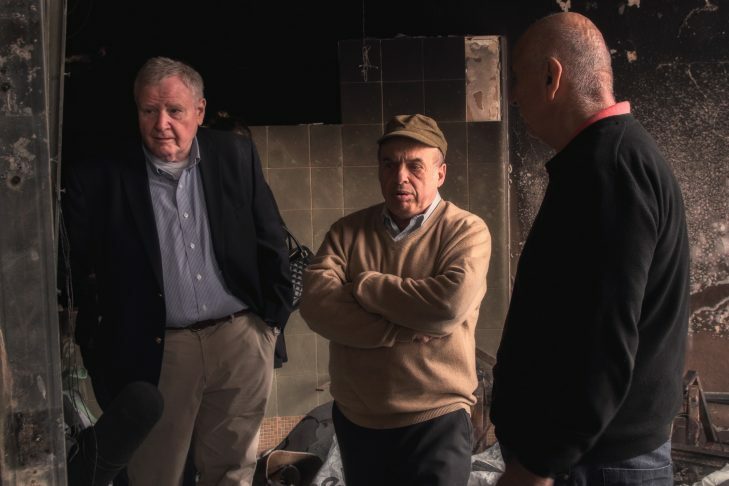 On Wednesday, I visited the people and institutions that bore the brunt of the terrible Haifa fires. In the past, I’ve visited both Haifa and Sderot in times of war and have seen the destruction caused by rockets. But I have never seen as many homes and businesses so totally destroyed as I did in Haifa this week. As we assessed the damage, hugged and consoled the victims, and heard their stories, we literally walked over the wreckage of their lives – over floors covered in broken glass from windows and picture frames, smashed dishes, mangled steel, and charred wood. The air was thick with the smell of burned plastic. Ash covered our clothes, and we couldn’t quite wash our hands and faces clean of it. I couldn’t help but think of the fires that consumed ancient Jerusalem over 2,000 years ago. Despite all this, the victims demonstrated remarkable resilience. They told us that their children were safe, that their elderly parents had been rescued, and that the wreckage consisted only of physical possessions. But some of those possessions were irreplaceable: wedding albums, 100-year-old family pictures, and menorahs that had traveled from the wreckage of Europe to the safety of Israel. Now, these precious mementos were unrecognizable or unsalvageable, covered with dust and ashes. In one home, the owner seemed comforted that the family menorah had somehow been saved and could be used this Chanukah. When one of my Boston-Haifa Connection colleagues discovered a havdalah candle holder given to him by a grateful client intact in the ash, he was overjoyed that it had been saved and would be used to close this coming Shabbat. A few houses down, a woman told us of her parents’ burned-out home where her mother, a therapist, treated abused children. Though the office was gone, her mother continued her work without interruption, treating her young patients in their own homes. Natan Sharansky, chair of the Jewish Agency for Israel, was also in Haifa. Together, we walked through the wreckage, consoling victims and bringing cash assistance on behalf of CJP and federations around the country. Sharansky, a man who defied the Communist empire, taunted his judges at his sentencing, and outlived the Siberian Gulag, is a living symbol of courage and hope. I needed his inspiration and strength as we walked through houses decimated by fires. We visited Yeshivat Mevaseret Shalom, a synagogue, school, kollel, and hesder yeshiva where young men combine Torah learning and army service. The study halls of the yeshiva were completely destroyed. While the Torah scrolls had been saved, most of the prayer books, copies of the Talmud, thousands of seforim (holy books), and students’ tefillin and talisim were not. For Jews, these texts are sacred. When they fall to the ground, we kiss them as we would kiss our own fallen child. We bury the charred remains of these texts as we bury our deceased. Seeing the burned books brought tears to my eyes and conjured terrible memories of synagogues burned by Nazis. The Moriah Synagogue, the oldest Conservative synagogue in Israel, lost its entire second floor and thousands of sacred volumes from the synagogue library to the flames. The burned floors were covered with hundreds of thousands of charred pages, each one telling an ancient and sacred Jewish story, a story that also was frequently marked by fire. My final stop before returning to Boston was the military academy at Reali Beit Biram, an elite military school and Boston-Haifa Connection partner. The school was nearly destroyed by the fire. The director of the school, an IDF veteran, watched as his home burned to the ground. He, along with several young cadets, fought a losing rear-guard action with garden hoses to save what they could of the school. Two of the young cadets were with us and described how well they had learned their lessons: they stayed calm under fire, they had fought until they were nearly surrounded, and had re-treated only when they were left with no choice. The commander told a harrowing story of his son who had barely made it out of their home with their two dogs. The Haifa tragedy was caused by the driest conditions and the highest winds anyone could remember. The winter rains in Israel that many Jews began praying for in October were very late in arriving this year, causing the ground and trees to become tinder for the fire. Only rain over the land of Israel could end the threat that they would continue. Just as we said goodbye to our new friends at Reali Beit Baram, a light rain began to fall. And just over our heads, over the school, and over Haifa, a bright rainbow appeared. It reminded me of the rainbow over our rally two years ago. For me, the message was clear, just as it was then. Even in the shadow of destruction and fire, God is present, remembering the covenant, acknowledging the bravery and resilience of God’s children and promising a world renewed, a world filled with rebuilding, a world filled with promise and hope. The hope of Haifa is the hope of every generation since Noah saw the first rainbow promising a covenant of peace. It is a promise that tomorrow can bring a better world, a world free of prejudice, a world of coexistence bound together in love. Barry Shrage has served as president of CJP since 1987.